Safety cabinets protect flammables and hazardous chemicals from fire with their fire-resistant design. 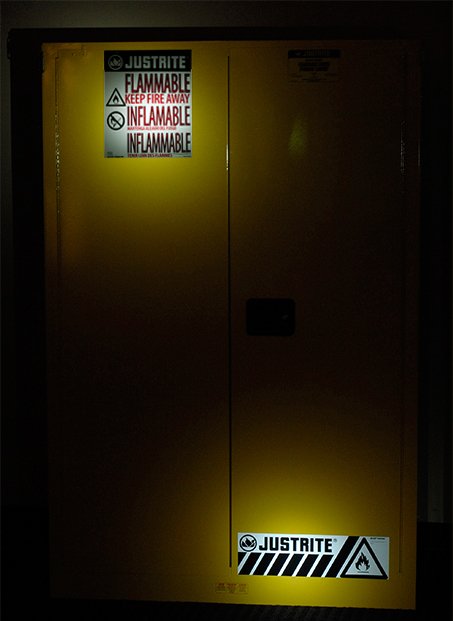 Justrite safety cabinets feature exclusive Haz-Alert™ warning labels. These help firefighters identify what hazards they may encounter as they extinguish the fire. What is a Haz-Alert Safety Label? Justrite Haz-Alert safety labels are reflective when illuminated with a flashlight. This is beneficial during power outages or in fire conditions where smoke hampers visibility. Haz-Alert safety labels provide warnings in English, Spanish and French. Where are Haz-Alert Safety Labels Placed? A hazard warning label is required by OSHA and NFPA. Haz-Alert warning labels inform all workers to the contents of a safety cabinet. Safety labels are placed on the front of the cabinet, near the top. Justrite applies the labels during the manufacturing process so that all units are uniform. Many Justrite safety cabinets also have a Haz-Alert safety band label located near the base of the cabinet. These labels warn firefighters crawling through smoke filled rooms about the contents of the safety cabinets. What are the Different Types of Haz-Alert Safety Labels? FLAMMABLE - Indicates chemicals that ignite easily. These chemicals meet the class or category criteria of NFPA 30 and OSHA 29. ACID - Indicates corrosive acids that may cause chemical burns when they contact the skin. HAZARDOUS - Indicates acids, bases, oxidizers or water reactive substances. These materials are highly reactive. Never store incompatible substances in the same cabinet. Are There any Other Types of Safety Labels? Lithium-Ion Battery labels are also available. A supplemental 10-pack label kit can be used as either a replacement when additional application-specific labels are needed for Justrite's hazardous material cabinets (royal blue), or to retrofit an existing Justrite steel corrosive cabinet (light blue). Only Justrite cabinets feature exclusive Haz-Alert warning labels. All safety cabinets come with pre-applied labels, but extra Haz-Alert labels can be purchased separately for added visibility from different angles.